The Alma Hotel and Lounge is located in the best location in town; right at city center on the corner of Yavne Street and Rothschild Blvd. 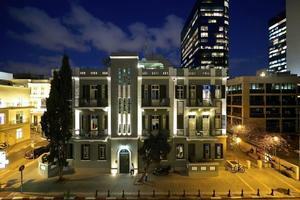 five minutes’ walk from Neve Tzedek the "Soho" of Tel-Aviv and only 12 minutes’ walk from the Mediterranean Sea shore. The Alma Hotel & Lounge is a precious gem full of dazzling surprises, the amazing building designed by architect Dov Tchendovski in 1925, brought back to live in 2012 by with preservation work of architect Ari Shaltiel that created 15 rooms, suites and the hotel restaurant The Alma Lounge. Expect outstanding culinary feasting in the Alma Lounge, where you will be spoilt with innovative contemporary cuisine that reflects our ongoing dedication to award-winning dining. And of course, when it comes to glittering service, look no further than the effortless expertise of our team, because Alma is for guests who don’t compromise.